Advertisers want to protect their brands from damage that comes from association with illegal activity. Online advertisers face risks from sites that infringe on the rights of others by facilitating the distribution of pirated content and counterfeit products. Many of these sites also use fraud or deceptive practices to avoid the standards set by the advertiser or its agency, driving revenue to those who steal copyrighted content or otherwise violate others’ trademarks. The mission of the Anti-Piracy Working Group is to help advertisers and ad agencies avoid damage to their brands from ad placement on websites and other media properties that facilitate the distribution of pirated content and counterfeit products. TAG’s Anti-Piracy Working Group is focused on implementing its recently launched Anti-Piracy Program. 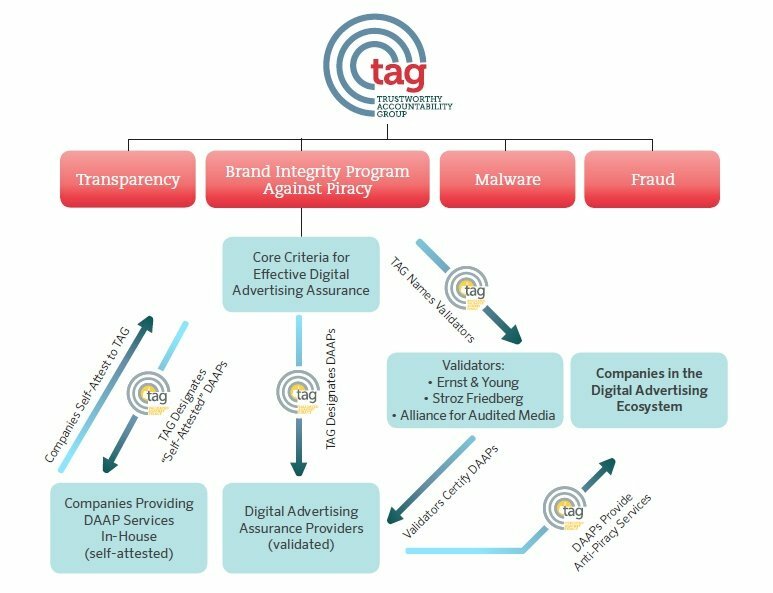 Under the program, TAG works with authorized independent third-party validators, including the Alliance for Audited Media (AAM), Ernst & Young and Stroz Friedberg, to certify advertising technology companies as Digital Advertising Assurance Providers (DAAPs). To be validated as a DAAP, companies must show they can provide other advertising companies with tools to limit their exposure to undesirable websites or other properties by effectively meeting one or more criteria. TAG also invites all advertisers and agencies to apply to obtain their Certified Against Piracy Seal and take the Anti-Piracy Pledge demonstrating their commitment to take all reasonable steps to prevent their ads from showing on pirated or infringing websites. To join TAG’s Anti-Piracy Working Group, please review the TAG Intellectual Property Rights and Anti-Trust Policies and sign the Acknowledgment form before sending it via email info@tagtoday.net. You will receive an email confirming your participation.